Toronto, Ontario--(Newsfile Corp. - April 12, 2019) - Further to its press releases dated March 6, 2019 and March 25, 2019, Drone Delivery Canada Corp. (TSXV: FLT) (OTCQB: TAKOF) (the "Company") is pleased to announce that in connection with its previously announced bought-deal prospectus offering (the "Offering") underwritten by GMP Securities L.P., Canaccord Genuity Corp. and Echelon Wealth Partners Inc. (collectively, the "Underwriters"), the Underwriters have partially exercised their over-allotment option, today purchasing an additional 344,200 common shares in the capital of the Company (each a "Share"), and 626,250 Share purchase warrants of the Company (each whole such warrant a "Warrant") for additional proceeds of $482,352. Each Warrant entitles the holder to purchase one Share at a price of $1.50 until March 25, 2021. If the volume weighted average price of the Shares on the TSX Venture Exchange (the "TSXV") is equal to or greater than $2.00 for a period of 10 consecutive trading days, then the Company may within ten business days accelerate the expiry date of the Warrants to the date that is 30 days following the date on which the Company issues notice to all the Warrant holders of the new expiry date. The Company will also issue a press release on the same date as it issues notice confirming the new expiry date of the Warrants. Thanks Lynnsa, great video, I like just after 3 minute mark, Air Canada VP says DDC is 3 or 4 years ahead of the competition globally, WoW!!!! Effective at the opening, Monday, April 1, 2019, the common share purchase warrants of the company will commence trading on the TSX Venture Exchange. The company is classified as a technology company. These warrants were issued under a warrant indenture dated March 25, 2019, pursuant to the company's short form prospectus dated March 20, 2019. Each warrant entitles the holder to purchase one common share of the company at a price of $1.50 (Canadian) per share until March 25, 2021. 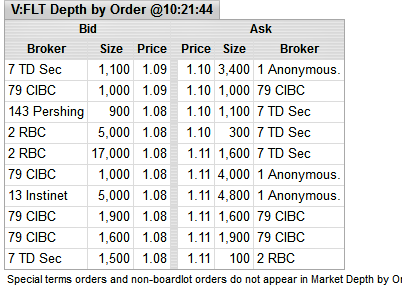 If, at any time prior to March 25, 2021, the volume weighted average trading price of the common shares on the TSX Venture Exchange equals or exceeds $2 (Canadian) for 10 consecutive trading days, the company may, within 10 days of the occurrence of such event, provide written notice to the holders of the warrants and the warrant agent, supplemented by way of a news release, accelerating the expiry date of the warrants from the warrant expiry date to the date that is 30 days following the date of such notice. Any unexercised warrants will automatically expire on the accelerated expiry date in accordance with the warrant indenture. As Drone Delivery Canada Corp. moves to commercial operations and revenue generation in 2019 in remote Canada and rural Canadian communities, the company will also be immediately pursuing eight additional business verticals where the company sees great growth opportunities. In 2019, Drone Delivery Canada will also be actively pursuing opportunities in eight other additional verticals that include health care, pharmaceuticals, oil and gas, mining, agriculture, forestry, construction, and courier companies. Additionally, Drone Delivery Canada has released a promotional video that focuses on the company's commercialization and highlights the need and opportunity in the areas that Drone Delivery Canada is additionally pursuing. The video comprises of a six-minute film with three interviews with Michael Zahra, senior vice-president of operations and strategy for Drone Delivery Canada, Tim Strauss, vice-president of Air Canada Cargo, who sits on the advisory board of Drone Delivery Canada, along with Deepak Chopra, former chief executive officer of Canada Post, who is also a member of Drone Delivery Canada's advisory board. "The opportunities in front of us are not only with the many Canadian first nations and Inuit remote communities, but also with a broad range of government, commercial and industrial applications globally. We are also seeing an increase in traction with our international customers globally as our drone delivery system continues to be validated globally. Our proven system is seen as a commercially viable delivery infrastructure solution to companies looking to reduce costs and dramatically improve logistics," commented Mr. Zahra. Ron - Do you have any info on the warrants that started trading? any suggestions?